165. Top Tips Tuesday - Climb It Now! If you are one of the many who didn't lift your mast out at the end of the 2016 season and haven't, as yet, made a trip aloft to check your rig out, now is the time to climb that spar before you set off on your summer cruise. Why? Because you never know what issues you may find up there! 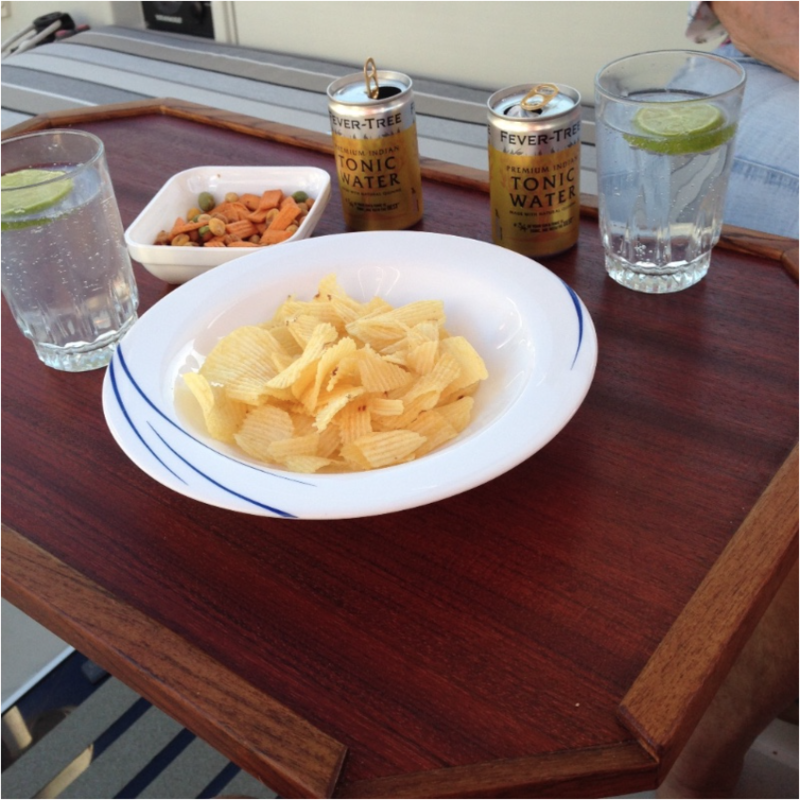 The other week, whilst in Corfu, a member of my local club who is living the dream and keeps his yacht out in Greece met up with Jenny & I in Mandraki for just a couple of beers and a bite to eat. Conversation, as always amongst us blokes gathered round the table, inevitably got around to boats and after what I think was a 'couple' more beers (or was it more?) I found out next morning that I had apparently volunteered to climb his mast and check his rig out. When professionally climbing a mast back in the UK I always use a Spinlock Mast Pro "bosuns chair", as I think its the most secure of all the chairs on the market (and of course that's the make we have on our Mystery) along with a Solent Top Climber. This allows me to 'stand up' in the chair and get right to the very tip of the mast head gear. When climbing a mast for an inspection I always take a mobile phone with me, Leatherman, roll of pvc tape and white self amalgamating. Should my Leatherman multitool not provide me with the correct size screwdriver or pliers one can always be hoisted up. Two days later (not that I needed a full day to sober up) as it was bright sunshine, and as I am long sighted, I climbed his mast wearing my Gill bi-focal sunglasses. Yes I know I have said it before but what a brilliant item of kit this is! For safety reasons I always go up on two halyards and would strongly reccomend that you do also, this is after examining the halyard for strength (get your winch man to hoist you so that your toes are just touching the deck then bounce up and down as hard as you can) and any signs of chafe. Satisfied with the integrtity of the climbing halyard and the back up one, I was then winched up the mast, got to the lower set of spreaders and discovered that the casting on the starboard spreader root had a small tear and that the clevis pin was missing the stainless ring; a piece of bent wire had been substituted. 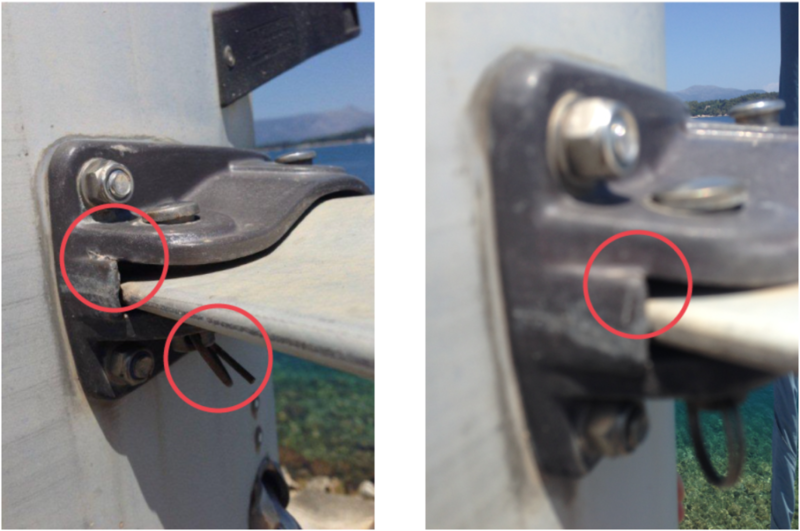 Climbed further and found that the same had happened to the upper starboard spreader bracket, once again a small tear. As the owner of this boat is not happy aloft, this is where my mobile phone comes in useful, providing images that can be down loaded later onto a computer or in this case to my iPad so they can view from the comfort of the cockpit. No more issues until I got to the top of the mast and found that the inner forestay was badly stranded where the wire entered the rollswaged T-terminal! Inner forestay condemned and as for the tear in the spreader root(s) I suggested that he monitor the bracket(s) over the next few months. Fast forward two weeks and now back in the Uk, with even the temperature on the North East coast as hot as Corfu, and this time the task was to fit a replacement TV antenna at the top of a mast. Climbed and once up there, before we fitted the Glomex antenna, noticed that his mast head tri was way past its sell by date. Upper and lower part of the light full of water and the lens badly crazed from exposure to sunlight! Not only that, the halyard diverter had seen better days. It was badly worn where it clamps on the forestay wire allowing it to tilt, making it as much use as a chocolate fire guard! My message, it's always a good idea to inspect your mast at least once a year. 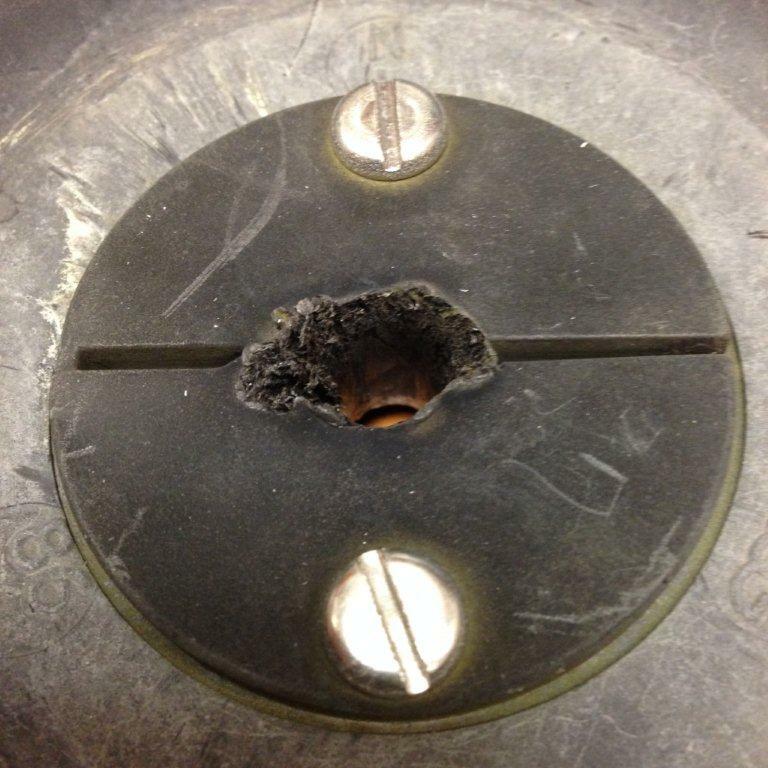 Click onto this link for our thoughts on mast inspection. 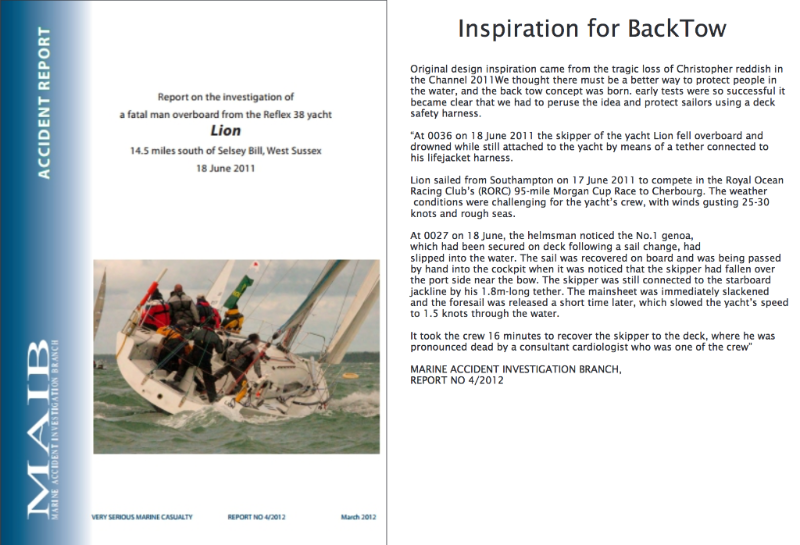 This entry was posted in General Interest, Safety, Products in the spotlight, Top Tips Tuesdays, Outwards & Upwards, Repairs, Maintenance, Rigging, Crew Gear, Cruising, Gift Ideas and tagged Solent Top Climber, Leatherman, Spinlock Mast Pro, bosuns chair, climbing a mast, Gill bi-focal sunglasses, Glomex antenna, mast head tri, Mast and Rig Inspection on June 27, 2017 by Rob Storrar. I'm now just getting my feet under the table after our Mystery delivery trip (Marseille to Corfu with the majority of those 900 odd nautical miles under power) so after expecting a load of ripped sails and new orders for canopies etc I popped into work Sunday to check on the ‘state’ of the loft and run through old e-mails and came across a mail shot from one of our regular suppliers which certainly made me 'sit up and take notice'. So what got me all excited? It was a new take on lifejacket design. I first read about the TeamO concept some years ago, thought it was a good idea and heard nothing more until I opened the attachement! The TeamO patented Backtow lifejacket functions in a man-overboard situation by turning the user into a face up seated position once they enter the water and are being towed towed alongside the vessel. This of course keeps the airways clear of the water and allows communication and immediate rescue by the crew. 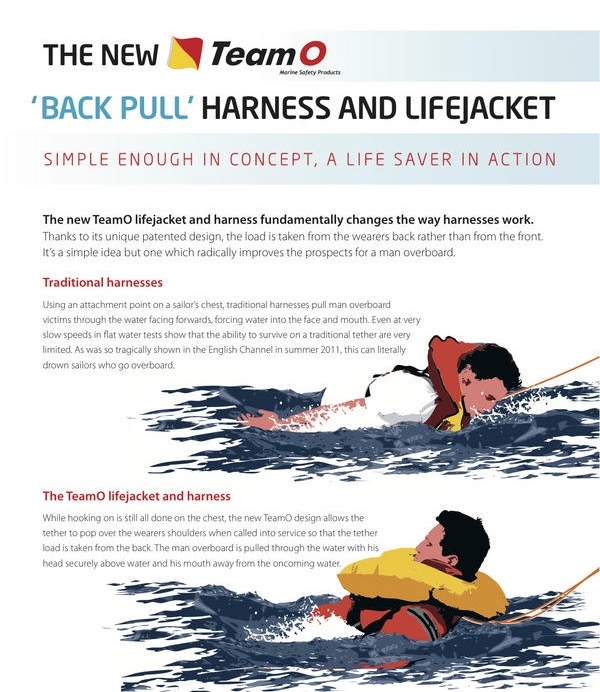 The TeamO Backtow lifejacket will turn an unconscious person into a SAFE position and requires no subsequent action by the user to maintain this position, the Backtow also reduces the risk of injury during recovery. Watch the video it will certainly make you sit up and take notice! 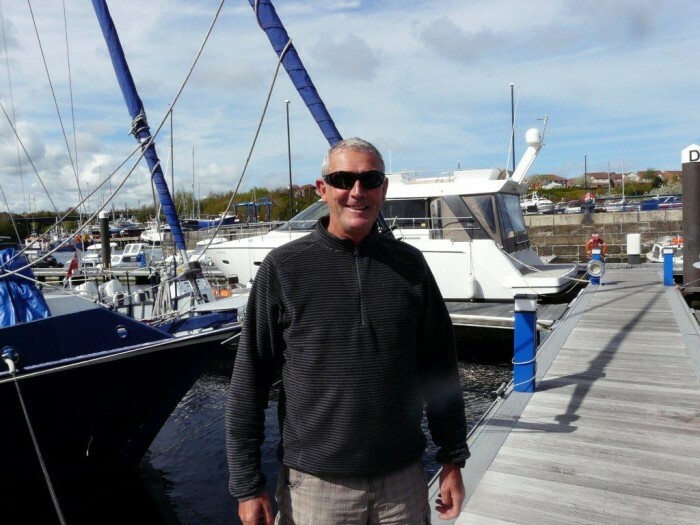 This entry was posted in General Interest, New Products, Safety, Products in the spotlight, Top Tips Tuesdays, Crew Gear, Cruising, Gift Ideas, Life Onboard and tagged Lifejackets, Team O, BackTow, Automatic Lifejackets, Harness, BackTow Harness on June 20, 2017 by Rob Storrar. Living in the North East of England at the coast it can be said that we never suffer from too much sun, it can be a lovely sunny day 400 yards inland, however, due to the fact that we get rather more than our fair share of Harr or sea frets as the phenomenon is better known, the seaside can often be enveloped in a thick damp mist! However, now we have finally got Hindsight moored in the sunshine, only three years late, we do need a bit of shelter. Due to a number of factors I never got round to finishing the bimini on Hindsight before she was trucked down to Marseille and then motor sailed on to Corfu. Our bimini, complete with over long stainless frames and mounting brackets, is almost ready to install but sadly languishing in the sail loft back in Newcastle. 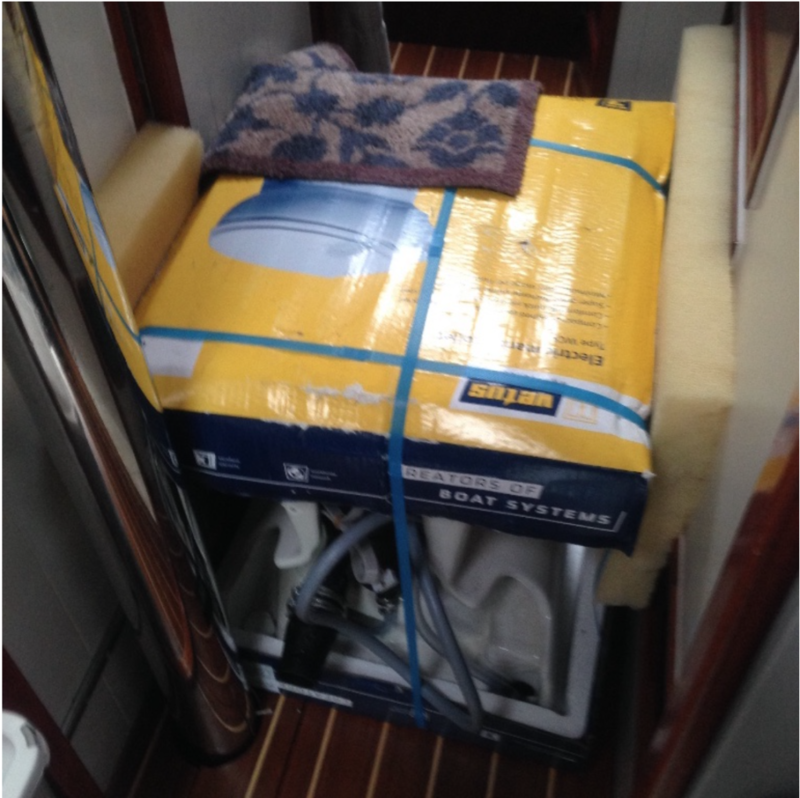 A side issue to its shipping being that there was a distinct lack of space to store it down below as boss man Andy decided that we should ship a toilet out with us to Port St Louis to placate a 'desperate' customer as carriers had let him down badly. I hope the customer managed to "bucket and chuck-it" for a few days before we dropped it off at the boat hoist in the marina! As Jenny was flying out to Corfu after Hindsight had arrived, my cunning plan was for her to bring out a Blue Performance Sunshade in her hand luggage (along with all the other 'bits' that I had forgotten) as our means of obtaining shelter from the sun. It has been an essential asset and because it is so easily broken down, when the storm hit yesterday it only took a couple of minutes to dismantle, however, perhaps I should have left it up as some of the hailstones ricocheted down the companion way steps! What other bits did she bring out in her hand luggage? It included two hatch and a companion way mozzie net, some of those brilliant stainless steel clothes pegs and a ball and cone set. As for the bimini, it will be loaded into the car (bars tied to the roof rack) along with all the other things I have forgotten or not finished when we come back in early September with Millie the dog! This entry was posted in Top Tips Tuesdays on June 13, 2017 by Rob Storrar. Well Hindsight was finally launched at Port Napoleon near Marseille on Friday the 19th May, this was followed by three frantic days of even more 'boatbuilding.' Fortunately I had on board two experienced and very practical big boat sailors, Trevor & Martin, who managed to turn their hand to everything thrown at them on an incomplete boat, including leak solving on both heads and galley sinks, priming the calorifier, successfully reconnecting the mast wiring (all labelled but minus legible writing) coaxing the autopilot into life etc etc. Trevor, our navigator and my mentor, had suggested that I purchase extra fuel containers, however with a main tank of 115 litres capacity, a keel tank of 35 and a extra couple of 10 litre containers I felt that we probably had enough capacity to get us across to Corfu. Our navigator however decided that with a light wind forecast I should purchase a couple more 20 litre containers which we duly did, in hindsight thank goodness for that! The marina at Port Napoleon is huge and lift in/mast stepping is very efficient however there is no fuel berth, yes they will get diesel for you but 150 litres, you must be joking! 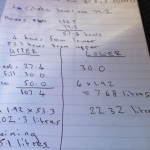 Nowt less than 2000 litres gets you the fuel bowser. And don't ask for a beer at five to ten in the evening in the restaurant! 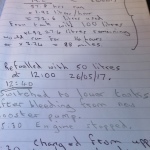 So with only 20 litres in the main tank (the transport company who did an excellent job of trucking it from Newcastle to Port St Louis wanted as little as possible fuel on board) and 30 litres in the 'keel tank(s) we went looking for fuel. Found it at Port De Bouc, filled the main tank to the brim only to discover the fuel pouring into the bilge, leaking from an incorrectly assembled inspection hatch. Yes, another of my many 'build' blunders! 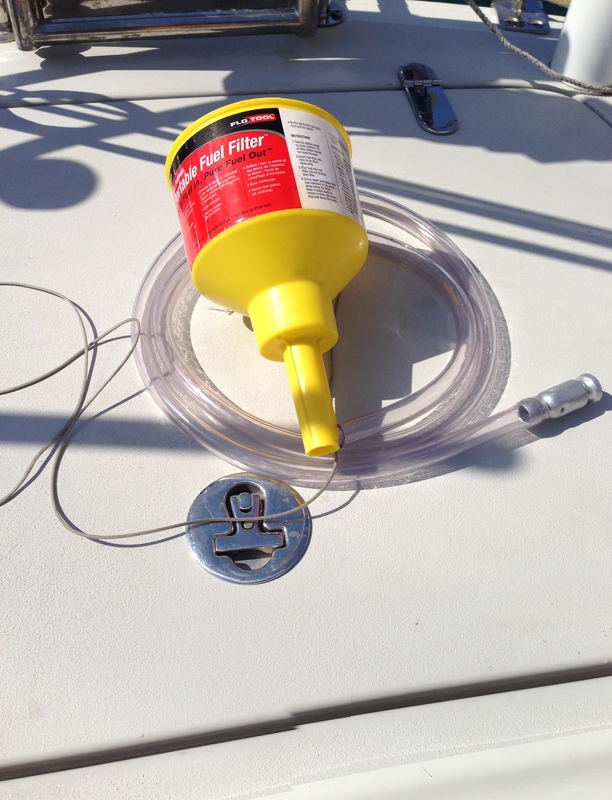 Using Jenny's stainless teapot as a container we managed to transfer approximately 15 litres of contaminated fuel from the bilge to our two ten litre tanks. 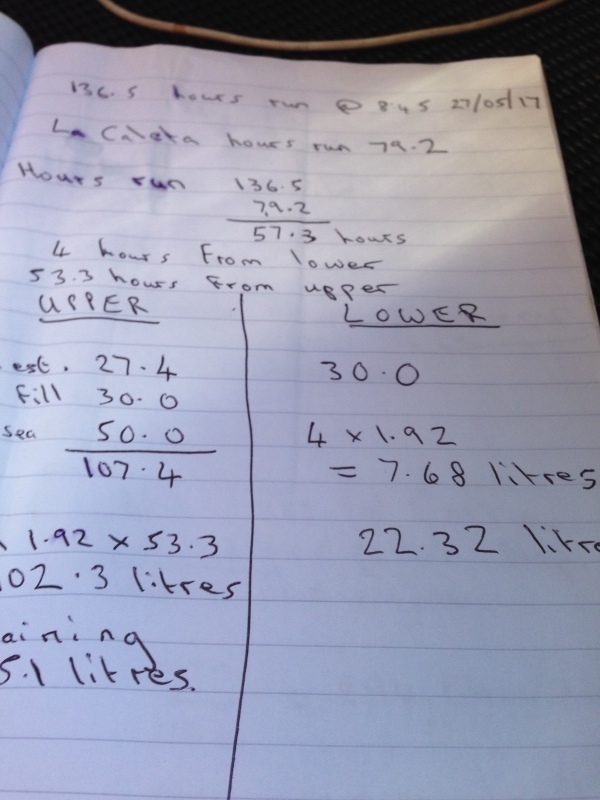 Sorted the leaking hatch out and filled the 20 litre cans and 'set sail' destination Corfu. 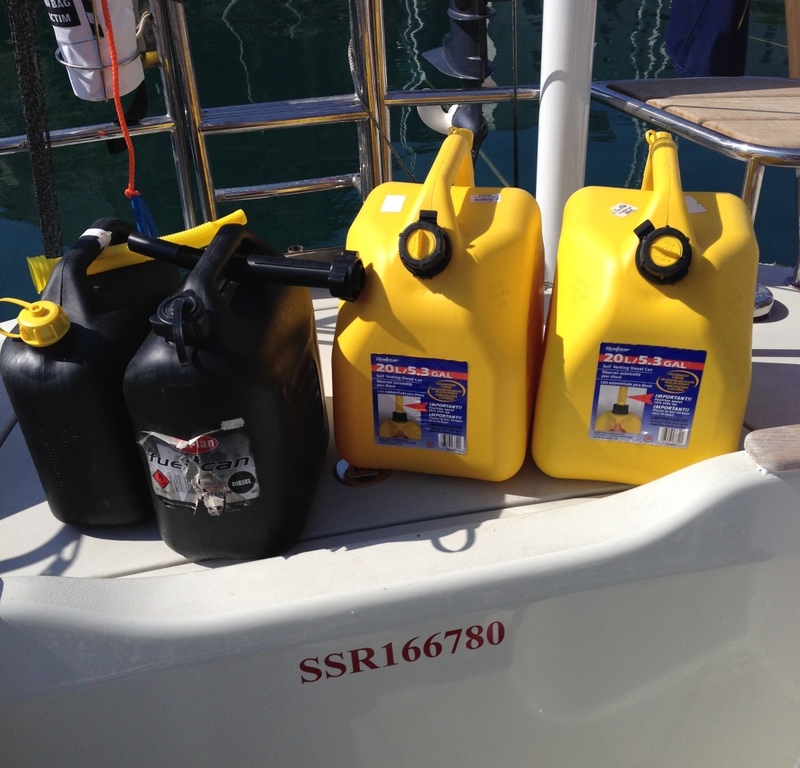 Well we motored and motored and motored with a very small amount of sailing down to the island of Sardinia topping the main tank up on the way from the 20 litre containers using one of those wonderful ' shake your wrist' fuel transfer pumps and filtering it through our Mr Funnel fuel filter. Yes there was a little motor sailing but where was the breeze? We arrived La Caletta Marina but of course as it had just turned 11am the pumps were closed and fuel wasn't available till much later, however, we patiently waited and spent most of the time searching the port and surrounding area in vain for the rubbish bins! Tanks full, on we motored for another two days, I had hoped that we might get the main tank filled again before entering the Straits of Messina but it was not to be, the timing was all wrong. Sat night saw us motor through the straits of Messina with a lot of traffic and buzzed by the port authorities when we switched on the EchoMax. Early Sunday morning we exited the straights, turned to port and motored up the heel of Italy. At last the breeze filled in, on the nose of course, but hey at least we were sailing! Lasted a couple of hours and then on with the engine again. Later that day the wind returned and in anticipation of a great sail we hoisted the cruising chute, that lasted about 40 mins. 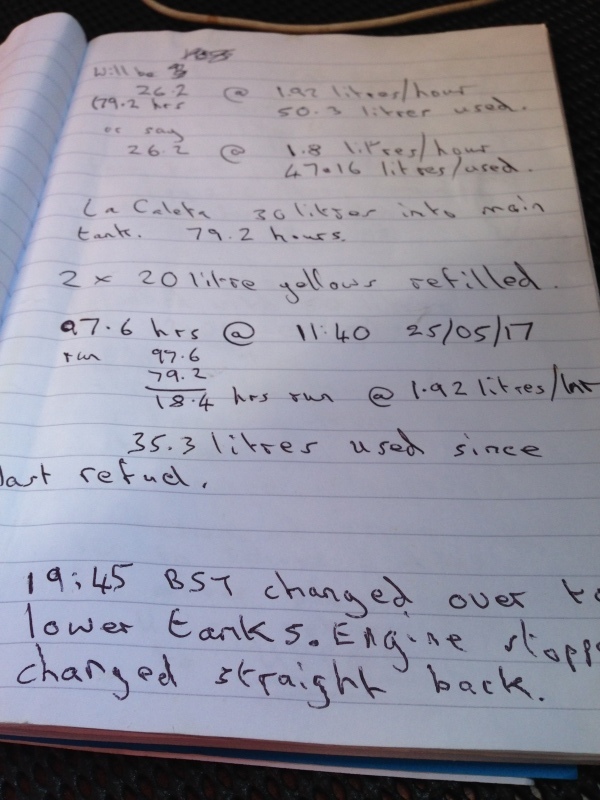 So engine on once again and then the wind arrived and we actually sailed for eighteen hours close hauled at first, then two and finally three reefs, as the wind eased we tight reached till 1300 hours on the 28th, once again with the wind dropping. 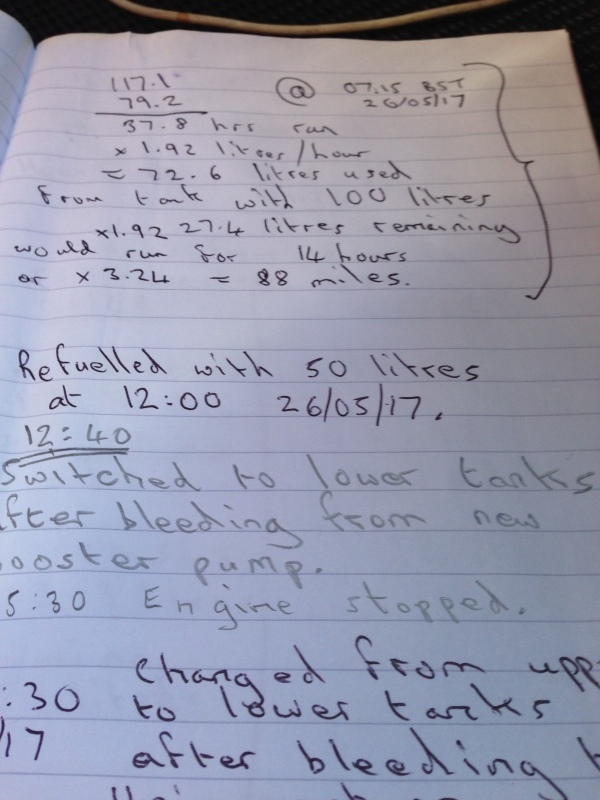 Again it was engine on again and with the end almost in sight it was a case of let's go for it and use the dregs of the contaminated fuel which we strained again through our brilliant Mr Funnel Portable Fuel Filter. Mr Funnel certainly lived up to its name as the fuel rescued from the bilge was found to contain at least a litre of water which it successfully filtered out. 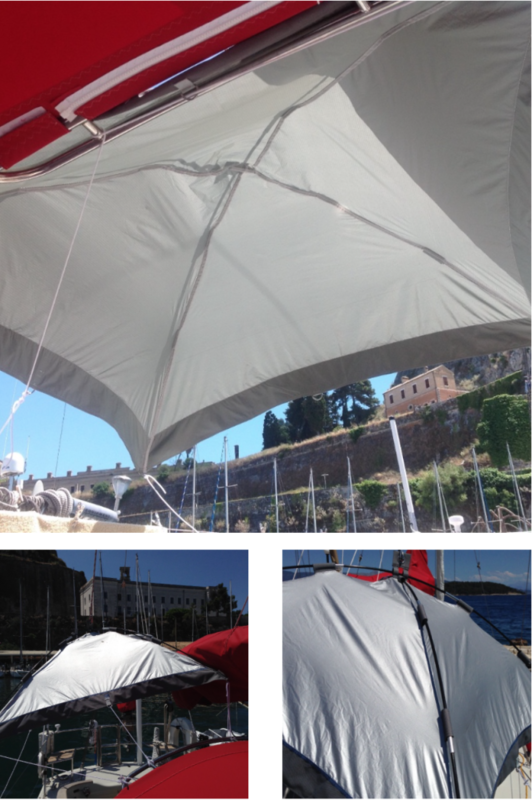 So running on fresh air we finally reached our destination, the marina at Mandraki Corfu. 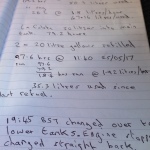 Engine running hours 128.4 hours, trip miles 900nm, 275 litres used, 3.2 miles/litre all figures courtesy of Martin. This entry was posted in Top Tips Tuesdays on June 6, 2017 by Rob Storrar.